Though cold weather on the US East Coast and a slower-than-expected return from works for Exxon’s Rotterdam refinery has exacerbated short-term tightness in Atlantic basin diesel markets, they are due for a pause. December is a slow demand period, and arb flows from the US and Asia to Europe are picking up after an October lull, and with cracks performing well, refiners will push out product as hard as possible in the coming weeks. But into the new year, there is a good chance the diesel market could perform again (or at least not crater as many expect), with Indian demand to be strong until at least the spring general election, and its refineries undergoing a series of shutdowns in preparation for the shift to BS-VI fuel specs in parts of India from April. Low stocks on the USEC will pull cargoes away from Europe as well if cold weather persists. Indeed, with heavy maintenance scheduled on the USGC from late January onwards, a cold US winter could be the catalyst for a fresh rally in Q1 19. 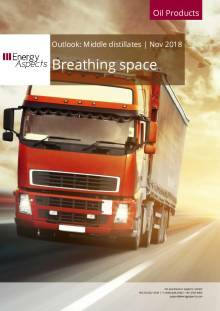 October was the tightest month for global diesel balances since April, but rising supply pushes November and December back into surplus. The stunning collapse in gasoline and an oversupplied jet market will only further encourage refiners to raise diesel yields. With refineries in ARA starting to come back from work, even if Exxon’s Rotterdam plant comes back slowly, ARA gasoil supplies have probably bottomed out. Cash markets are still very strong, reflecting limited supply at the front of the market, but these values should come off as ARA refineries boost output. Flows from East of Suez markets are also returning. Soaring Asian diesel premiums in October diverted Indian diesel exports to Singapore, keeping the Mediterranean market tight. But with European prices sky-rocketing last month and Asia softening, the Indian flows will swing back westward. But there will not be a deluge from Asia. India’s big turnaround programme begins with a total shutdown of Nayara Energy’s 0.43 mb/d Vadinar refinery starting 24 November, as well as work on BPCL’s Kochi refinery in December. Chinese diesel exports will also be capped by limited export quotas and tumbling diesel yields, as Chinese plants respond to local market conditions that have kept domestic diesel prices below those of gasoline. The earlier-than-usual timing of the Chinese Lunar New Year holiday will likely mean hefty shipments in late January and February, though this will coincide with the start of the next round of USGC works. European demand also looks to have recovered from its summer lows thanks to plunging oil prices. Diesel demand in Europe this summer was poor in many important markets, particularly in Germany, where demand fell y/y in all but one of the first eight months of 2018. Summer demand was also anaemic in France, but preliminary October data show a massive restocking by consumers last month, with heating oil sales jumping more than 46% y/y. The bottom line is that the extreme tightness that characterised diesel in November is set to fade. But with heavy maintenance expected on the USGC in Q1 19, and little evidence that Latin America will be able to significantly increase diesel output beyond the restoration of full production at Brazil’s Replan refinery, the flow of arbitrage barrels from the USGC to Europe could dry up within a couple of months, just when heavy Indian refinery maintenance in late Q4 18 and Q1 19 is rising.